The first construction of the new Russian capital, the Peter and Paul Fortress, occupies the central position in the architectural ensemble of city center, and the Peter and Paul Cathedral with its high bell tower is one of the main landmarks of Saint Petersburg. The silhouette of the Peter and Paul fortress became the main symbol of the city on the Neva River. On the 16th of May (27, New Style), 1703 Peter the Great founded a new fortress on Zayachii Island. 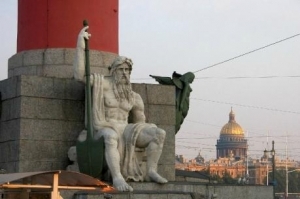 It was called Saint Petersburg in honor of Saint Peter. This date is recognized as the birthday of the city, which was rapidly developing under protection of the fortress. The plan of the fortress was worked out by Peter himself who made it in the shape of elongated hexagon with six projecting bastions, connected by curtain walls. The first defensive constructions were made of timber and earth, but in 1706 the construction works of stone buildings started under supervision of architect Tresini. He designed the majority of the fortress constructions, including the gala gates for the entrance to the fortress territory shaped as the triumphal arch. 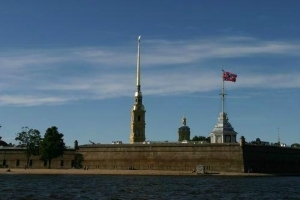 The ensemble of the Peter and Paul Fortress includes Commandant's House, the Engineers House, the Artillery armory, the Mint, the Treasury, the Guardhouse and other historical constructions. Noteworthy that for the majority of the Peter and Paul Fortress buildings the long-term constructions is typical. Some edifices were created not by one but several generations of talented architects. Paradoxically but although the Peter and Paul Fortress was built as a fortification construction it was never used as such. For almost two centuries it served as a main political prison of the country. One of the first convicts became Tsarevitch Alexey, the son of Peter I, who was against the politics of his father. In the prison of the Peter and Paul Fortress was confined the famous princess Tarakanova, who claimed to be the daughter of Empress Elizabeth and hoped to ascend the Russian throne. In the bastions of the Peter and Paul Fortress many revolutionists and free-thinkers, who criticized the absolute monarchy of Russian Empire, spent months and years in terrible conditions. Among them there were Decembrists, organizers of the failed attempt at the life of Alexander II, writers Nikolay Chernyshevsky and Maksim Gorky and many others. It was impossible to escape from the prison: during the whole period of the prison existence nobody managed to escape it. The special place in the fortress ensemble belongs to the Cathedral of Peter and Paul. It was built in 1713-1733 by architect Tresini on the place of a wooden church, founded in honor of apostles Peter and Paul. The cathedral is decorated with gilded spire 122,5 meters high, topped with the weather vane shaped as an Angel, who is said to watch over and protect the city. The cathedral of Peter and Paul served as a royal burial-vault. 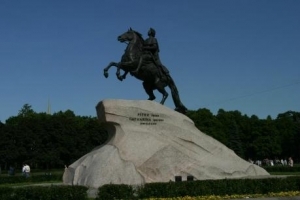 The founder of the city, Peter the Great is buried close to the south wall of the cathedral. The tomb-stones of Alexander II and his wife differ from the other tomb-stones of the cathedral. They are made of jasper and rhodonite, while all the tomb-stones of other Emperors are made of white Carrara marble. The last burial in the Cathedral of Peter and Paul took place on the summer of 1998, on the eightieth anniversary of the execution of Nicolas II, his wife Alexandra Fedorovna, their children and servants. The last Russian Emperor and his family are buried in the Ekaterininsky (Catherine) chapel of the cathedral. Nowadays on the territory of the fortress several interesting museums are functioning. At the Commandant's House visitors can get acquainted with the history of Saint Petersburg since 1703 till 1917. In the Trubetzkoy bastion one can learn a lot of interesting facts about the main political prison of Russia. The gas-dynamic laboratory and the printing house are also worth visiting. The cathedral of Saint Peter and Paul that is a burial vault of the Romanovs is also extremely popular with the tourists.